When Larry Vickers puts his name on something, it’s probably worth taking a look at it, but when Larry Vickers puts his name on something that Bill Wilson’s name is already on, it should go straight to your short list. I’ve heard nothing but good reviews from various sources on these sights so far, but I finally had the chance to try them out for myself this weekend and they really are a great product. For those of you who like the WC Battlesight for 1911s, this is very similar. 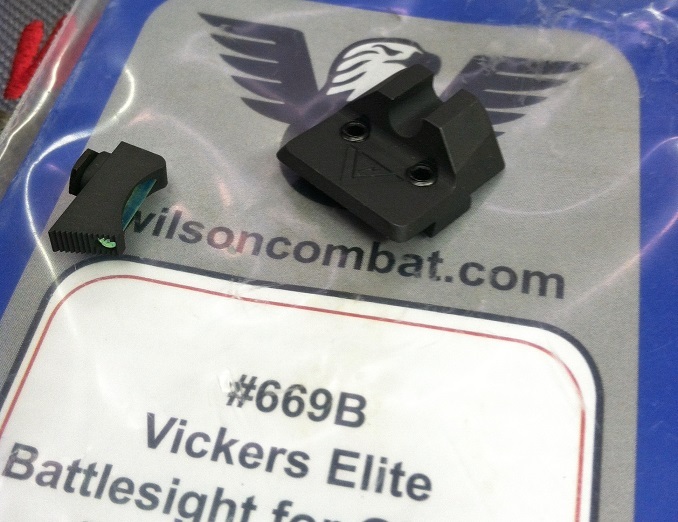 The rear Vickers Elite Battlesight is a plain black sight serrated at 40 lpi to reduce glare. It features a .145″ wide notch with a deep “U” cut. The .125″-width front sights come in various configurations (plain black, fiber optic, gold bead, and tritium) and two different heights: .230″ for .45 and 10mm and .245″ for everything else. 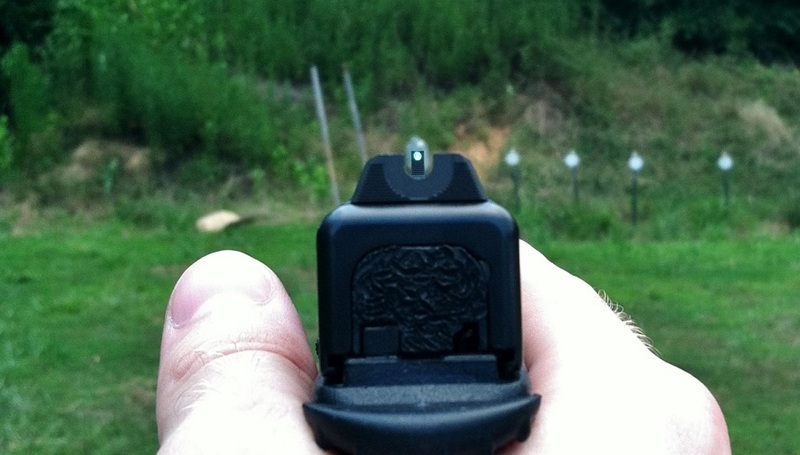 Like the rear, the front sights also feature fine serrations to cut down on glare in bright shooting conditions. Although I tend to run 1911-pattern guns, I’ve still used just about every sight offered for the Glock platform, from Dawson to Truglo TFO to Novak’s to Trijicons to the stock plastic crud that comes on them. But I’m extremely familiar with Wilson’s U-Notch sight profile because I use it every week at the range on my 1911, and I’ve grown to appreciate it for dynamic handgun shooting (particularly at ranges of 25 yards or less). Although the amount of light on each side of the front tenon can make precise shots at 35-50 yards a little bit prickly, for close-in transitions it allows for quick acquisition of the front sight and excellent functional accuracy. The green FO front really pops in the sunlight and should work well for any practical shooting disciplines. 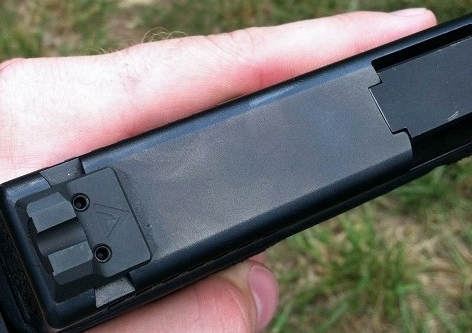 40 lpi serrations on both front and rear also cut glare to a minimum. 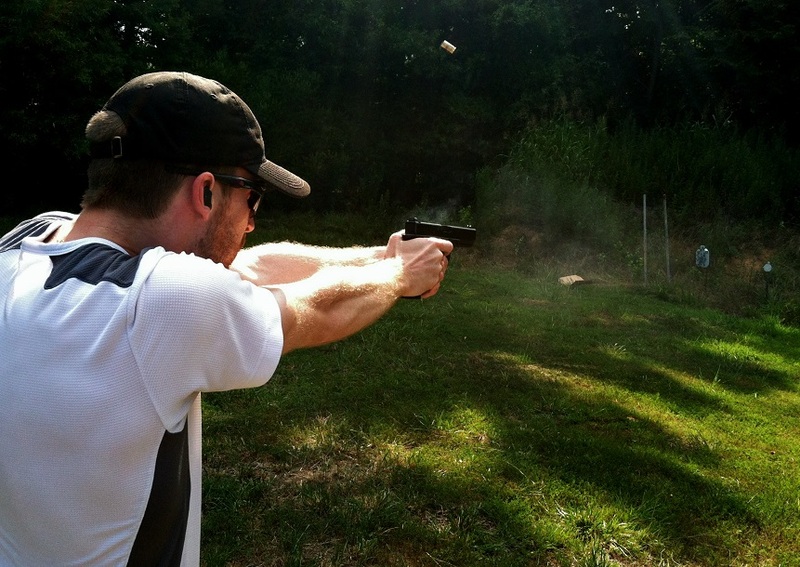 I shot some steel with a Glock 17 that was wearing the new Vickers Elite Rear Battlesight (with a green fiber optic front), and I was impressed at how well the gun handled and how quickly I was able to reacquire the front sight. Even though conditions were VERY bright, the brightness of the fiber optic rod didn’t wash out the front sight post. The semi-circle recess on the back of the Vickers rear sight (shown at left) is shallower than the one used on its 1911 cousin, which is a change I was very happy to see. In fact, that was a large part of the reason I switched to the Wilson Speed Sight on my Ultralight Carry, which features the same .145″ U-Notch without the recess (which I found to be a bit of a visual distraction). It’s completely a matter of personal preference, but for me, the Glock setup is preferable because it combines my favorite aspects of both the Battlesight and the Ultimate Speed Sight on the 1911 without the drawbacks of either (sharp edges on the speed sight). As-installed, the .245″ front sight and plain black rear shot to POA for me without any adjustments, and Wilson includes the wrench for the set screws with the rear sight.